At the centre of the conversation about the future direction of the church is, I think, a core dilemma. On the one hand, the church needs to try new things, to experiment, to be free to explore creative new pathways. Yet on the other hand, the church—like many other institutions—can be bound by tradition and custom and so be an unlikely place from which creative experiments are to emerge. Their decision to use Slavic generated great discord in the church. Other bishops insisted that they use only Latin resources, viewing Slavic as too vulgar a language for the works of the church. After a period of significant turmoil, in which Methodius was imprisoned, Pope Adrian II intervened on their behalf and permitted them to continue with their experimental work. By the time the brothers had died, the entire Bible had been translated into Slavic as had the entirety of Byzantine ecclesiastical law. 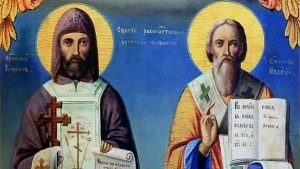 The two brothers are now remembered in the eastern church as “equal to the apostles” and, along with St. Benedict, have been declared co-patron saints of Europe. Great article Jesse, certainly one to reflect on!